Sean Dyche feels the club's key core values have "glued us back together again" as his side beat title hopefuls Spurs to make it eight games without defeat in the Premier League. Since the 5-1 Boxing Day defeat at home to Everton, the Clarets have climbed away from trouble, putting together their best unbeaten run in the top flight since they went nine without defeat in 1966. Indeed, they are three places and points from the top half after their recent resurgence, and Dyche said: "That's the Premier League, apart from the top six, I said it would work itself out, Bournemouth had a great start...the top six are a way in front, that's why it's such a big day when you beat teams like Tottenham, but the rest, the margins are really tight...Watford are doing really well as we did last season, but the margins are tight and we're working really hard to look after ourselves, we're not bothered about anyone else, and that has been a key focus from Christmas, get back to what we're about, what we stand for, the belief, the key core values, and I think that's glued us back together, and allowed the players the belief to go on performing, and that have been, very well. "The feeling in the camp has grown each game, and part of that is winning, but it's not just that, it's the undercurrent, it's been terrific and the players deserve massive credit for taking that on." Burnley hadn't beaten any of the established Big Six clubs since the opening day of last season, taking two points from the next 42 available, and the manner of the performance made it even more impressive, not having to soak up pressure and give up chances on their goal. Dyche said:"I talk about effective football and it's certainly as effective a performance as we've had all season. "We kept asking questions all afternoon, and the feel of the performance, and some of the quality as well, so I was very pleased. "It's very tough, they're a top side, and they have a way of finding control of a game, and I thought we didn't allow them too much control. "They started the second half with a bit more calmness, but I thought our pressing lines, the way we set up to stop them playing out from the back - I was really pleased with that. "They didn't have control in the way they often do, with their style, and that was part of our thinking, to make it feel different, and I thought we did that well, we set up from the keeper to press, and behind that, we asked so many questions of their back five and then back four, that eventually you think you're going to find something, and we did. 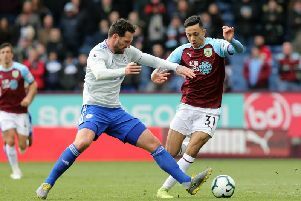 "It's hard for us, we've not made bold statements about rolling it around the back, 600 passes - you've got to find a way to win, and that's what it's like in the Premier League when you're Burnley. "We're finding ways to win once again, and there's a lot to be really pleased about, there;s some really good stuff, and the little in between things that we're doing really well, that we weren't doing as well early season, all the little details." "There were no big chats, we had a quick chat about and said ‘that’s not us’ and reminded them of a few things that make us what we are. And the players deserve a massive amount of credit and raised their game and energy levels. "The stats have changed radically, just on the simple demand of the physical side of the game, of running hard and pressing hard. They have got their rewards from that. "Now the biggest challenge of all is to keep doing it because we want to keep going. We are certainly setting ourselves a base to work from to do that and we have to challenge ourselves again with each game that comes past." Burnley look to match that 1966 run at Newcastle on Tuesday night, and Dyche is proud of the current sequence: "It is another historical marker and we have had many. "That is pleasing, a byproduct but it is very pleasing because it is win games and even draw games at this level. "Everyone is a good side and when you add in the Man U’s where we were unlucky not to win it and Tottenham in that run then they are big performances to get big points on the board. I am very pleased overall."